Clovis points are the characteristically-fluted projectile points associated with the New World Clovis culture. They are present in dense concentrations across much of North America; in South America, they are largely restricted to the north of that continent. Clovis points date to the Early Paleoindian period roughly 13,500 to 12,800 calendar years ago. Clovis fluted points are named after the city of Clovis, New Mexico, where examples were first found in 1929 by Ridgely Whiteman. 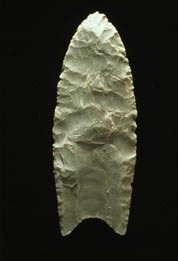 A typical Clovis point is a medium to large lanceolate point. Sides are parallel to convex, and exhibit careful pressure flaking along the blade edge. The broadest area is near the midsection or toward the base. The base is distinctly concave with a characteristic flute or channel flake removed from one or, more commonly, both surfaces of the blade. The lower edges of the blade and base are ground to dull edges for hafting. Clovis points also tend to be thicker than the typically thin later-stage Folsom points. with length ranging from 4–20 centimetres (1.6–7.9 in) and width from 2.5–5 centimetres (0.98–1.97 in). Whether the points were knife blades or spear points is an open question. Clovis points are thin, fluted projectile points created using bifacial percussion flaking (that is, each face is flaked on both edges alternatively with a percussor). To finish shaping and sharpening the points they are sometimes pressure flaked along the outer edges. Specimens are known to have been made of flint, chert, jasper, chalcedony and other stone of conchoidal fracture. Ivory and bone atlatl hooks of Clovis age have been archaeologically recovered. Known bone and ivory tools associated with Clovis archaeological deposits are not considered effective foreshafts for projectile weapons. The idea of Clovis foreshafts is commonly repeated in the technical literature despite the paucity of archaeological evidence. The assembled multiple piece spear or dart could have been thrown by hand or with the aid of an atlatl (spear thrower). Whether Clovis toolmaking technology was native to the Americas or originated through influences from elsewhere is a contentious issue among archaeologists. Lithic antecedents of Clovis points have not been found in northeast Asia, from where the first human inhabitants of the Americas are believed by the majority of archaeologists to have originated. Strong similarities with points produced by the Solutrean culture in the Iberian peninsula of Europe have been noted, leading to the controversial Solutrean hypothesis, that the technology was introduced by hunters traversing the Atlantic ice-shelf, meaning some of the first American humans were European. Around 10,000 radio carbon years before present, a new type of fluted projectile point called Folsom appeared in archaeological deposits, and Clovis-style points disappeared from the continental United States. Most Folsom points are shorter in length than Clovis points and exhibit different fluting and pressure flaking patterns. This is particularly easy to see when comparing the unfinished preforms of Clovis and Folsom points. There are different opinions about the emergence of Clovis points. One is that pre-Clovis people in the New World developed the Clovis tradition independently. Another opinion is that Upper Paleolithic peoples who, after migrating into North America from northeast Asia, reverted to inherited Clovis-style flaked-stone technology that had been in use prior to their entry into the Americas. Clovis points were first discovered near the city of Clovis, New Mexico, and have since been found over most of North America and as far south as Venezuela. Significant Clovis finds include the Anzick site in Montana; the Blackwater Draw type site in New Mexico; the Colby site in Wyoming; the Gault site in Texas; the Simon site in Idaho; the East Wenatchee Clovis Site in Washington; and the Fenn cache, which came to light in private hands in 1989 and whose place of discovery is unknown. Clovis points have been found northwest of Dallas, Texas. In May 2008, a major Clovis cache, now called the Mahaffey Cache, was found in Boulder, Colorado, with 83 Clovis stone tools. The tools were found to have traces of horse and cameloid protein. They were dated to 13,000 to 13,500 YBP, a date confirmed by sediment layers in which the tools were found and the types of protein residues found on the artifacts. ^ "A Clovis Spear Point". Archaeological Research Center. South Dakota State Historical Society. 2004-02-13. Archived from the original on 2009-05-18. ^ Elias, Scott A. "Paleoindian and Archaic Peoples". People of the Colorado Plateau. Northern Arizona University. Archived from the original on 2012-12-21. ^ "13,000-Year-Old Stone Tool Cache in Colorado Shows Evidence of Camel, Horse Butchering". University of Colorado at Boulder. February 25, 2009. Archived from the original on 16 October 2011. Retrieved 22 September 2010.